Serves you right for wearing a fur coat. This is more or less a true story, as long as you accept the premise that I have such a deep personal understanding of my cat that I understand the precise meanings of her vocalizations. Fairly certain this translation is accurate. The only thing that I’ve exaggerated is the size of the lemon tree and its proximity to the pool. Everyone knows you can’t plant trees that close to an in-ground pool. It’s hard not to feel sorry for someone who has to walk around in a heavy black coat in the desert summer, but at the same time, she also has the option of hanging out in the air conditioning and waiting until the sun goes down to hang out outside. I get that she wants to be near me, but given her typical feline disdain for swimming, it’s hard to see why. Like, we don’t have to be together all the time (that you’re awake), Cat. When I’m doing stuff you don’t like, such as hanging out in the sun or submerging my body in water, you’re not required to join me. It’s your choice, meaning it’s really not cool for you to complain about it the whole time. Fortunately for desert cats, there are always cool tile floors upon which to splay ones furry limbs. For the record, the cat is perfectly capable of swimming. I once saw her swim the entire length of the pool to get away from a another cat that was threatening her. So she could totally jump in and join me instead of whining about it. Anyway, this comic took about 5 hours to draw, and it among the best ones I’ve done so far. I’ve come a decent way in a year and a half. Maybe I will be ready for my next big project when the script is finished, hopefully in August. 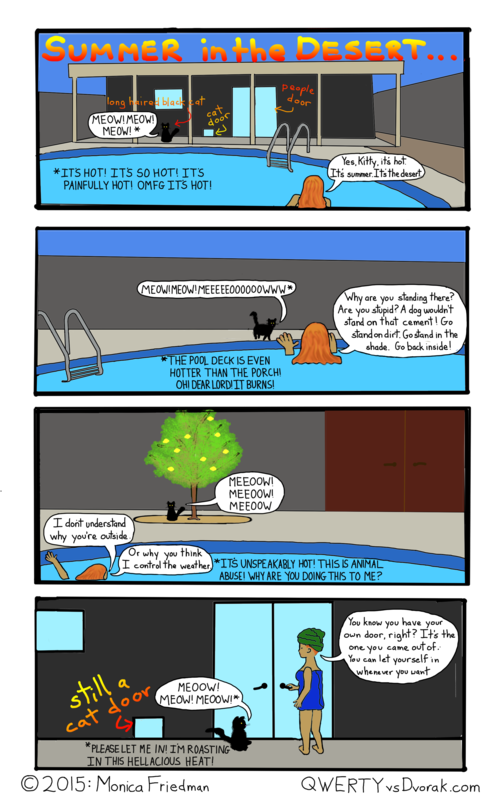 This entry was posted in comic, Comics, webcomic and tagged cartoon, cat, comic, desert, funny, heat, hot, summer, swimming on July 6, 2015 by littledragonblue.